Our beautiful FD30 Oak Plank Fire Doors are proof that safety does not have to mean compromising on authenticity. 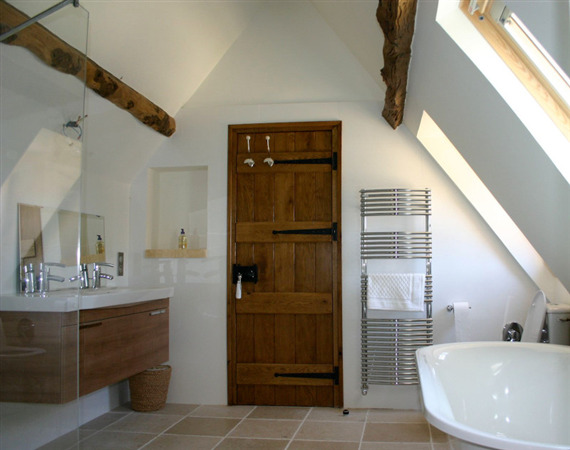 They are traditionally made to measure in our workshops in the same way as our Classic Oak Plank Doors from solid planks of French Oak, fixed with horizontal ledges on the rear. The only difference is that we use one set of planks to make the face of the door and another to make the rear to accommodate a discreet intumescent core and we fix these with four ledges on the rear rather than three to cope with the additional weight. Like our Classic Oak Plank Doors our Oak Plank Fire Doors available in a choice of more rustic Cottage or more classic Elegance Oak and come filled, sanded and ready to seal in situ. Alternatively they can be ordered finished with one of our workshop finishes. Oak Plank Fire Doors are typically supplied finished with decorative rosehead nails on the face but these can be omitted for a simpler, more contemporary look if preferred. Solid Oak Door Liners with smoke seals are available to complement our Oak Plank Fire Doors and are normally required to meet building regulations. Prices below are for Oak Plank Fire Doors up to 850mm x 2085mm.